Most store bought protein powders have isolated proteins which helps you gain muscle mass and complete your daily protein requirement.But have you ever wondered how are these powders so high on protein but extremely low on the other macros?A little research will tell you that these protein powders are highly processed to remove the other ingredients such as fats, fibre and carbs so that a small amount of powder provides large amount of protein.That’s one of the reasons I decided to make my own Vegan Homemade Protein Powder. Do you remember the whole wheat movement?There are so many documentaries made on how whole of America was suffering from lack of nutrients and basic macros which were removed while processing the wheat to make it into all purpose flour(maida). If removing the bran and germ from wheat to make all purpose flour , removes all its nutrients and makes it empty, I can’t imagine what removing fat, fibre and carbs from naturally available nuts and whey to make concentrated protein would be doing to these ingredients. And what about addition of unpronounceable ingredients in those powders to stabilise,texturize and flavour them? I decided to ditch the store-bought protein powders and make one on my own Vegan Homemade Protein Powder.This Vegan Homemade Protein Powder, though work in progress is a small step towards making a healthy nutrient rich protein supplement which is unprocessed, natural and totally free of crazy ingredients. I love Chia seeds..in fact I loved them even before they became the “Superfood” that they are touted to be now.Our Kulfi Faloodas are full of Chia seeds.They are called Sabja in Hindi. 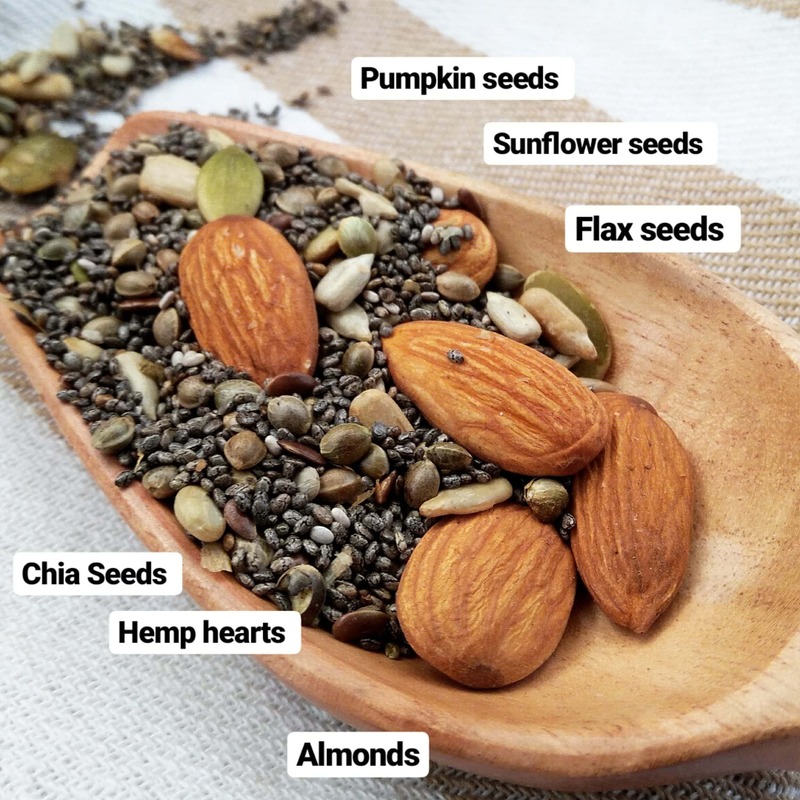 These green seeds are a power source of some hard to get nutrients like Copper,Vitamin E,Selenium & Vitamin B.In addition to these, Sunflower seeds are high on essential fatty acids,a great source of healthy fats,protien & fibre. Hemp Seeds or Hemp hearts are the seeds of hemp plant.Hemp seeds are the best plant based protein available naturally. -4 tbsp of Hemp Seeds contain 12 g of protein. These seeds are again a high source of protein & antioxidents.Theya re also very good for heart health & Blood sugar control. I dont think I need to say anything about Almonds. I think I have had them soaked for at-least half my days on this planet earth.We Indians take them very seriously! Obviolusy they are loaded with massive truckload of nutrients and it was in fact the first ingredient that I chose for this Vegan Homemade Protein Powder. I think you understand now.The reason I have chosen these specific seeds and nuts is because they are very good, balanced source of nutrients. -the number 1 source of Lignans which may reduce the risk of cancer and heart diseases. -A great source of high quality protein. Before you run off to make the Vegan Homemade Protein Powder, let me say a few things upfront. Please consult your doctor before consuming this if you have diabetes,heart disease, allergies or are pregnant. I don’t promise crazy a lean, muscled body. Lightly toast all the ingredients in oven or in a flat bottomed pan. Let the mixture cool completely.This step is important otherwise while grinding these the mixture will become into a butter instead of a powder. Pulse the mixture in your food processor.Remember not to over grind it otherwise the nuts and seeds will release their natural oils and become a nut butter instead. If you have any suggestions then please leave a message.I would love to improve on my recipe. Also take a look at my other super healthy recipes.I promise they are only good for you! Loved reading your blog. This blog has provided me valuable insight in protein powder. And this powder is looking delicious. I will surely try this for getting amazing benefits. This is truly fruitful for me. I searched for vegan protein powder and landed up on this site, your recipe seemed to be good and would be trying it at home, can you suggest option for hemp seeds? Also, how to consume this powder I mean with Milk, water? Hey Aditya..Hemp Seeds are a concentrated source of protein.Its easily available online.Try Amazon.If you don’t want to use it then I would suggest you just leave it out but the nutrient distribution will change based on that. I usually have this after or before workout in a shake made with fruit and milk(dairy and non dairy) of some kind. Its also great when sprinkled over breakfast oats or over a salad.My mom sometimes just adds it to her Chappatii aata too.